This print (c1776) gives another look at an undressed woman wearing her stays. She appears to be wearing an underpetticoat and stays with narrow tabs and decorative lacing often found on stays, which is purely decorative and not actually used to lace the front closed. 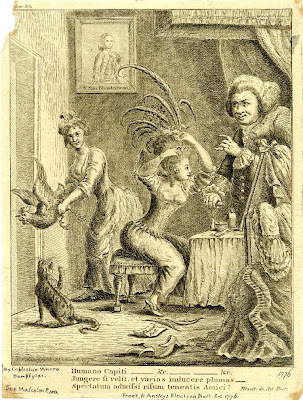 The poor chicken has been plucked to provide the feathers for the towering hairstyle, another spoof of the extreme fashion and high hair of the 1770s.